The seating was a little better than last year in that they tried to get us all at one large table. We'd still rather have a private room to use for our group. If anyone has an idea for next year's Christmas party, please speak up. After the meeting, many of us went for the annual Christmas train ride at the train museum. Its always cold, yet satisfying, to ride behind the little steam engine at Christmas time. Denny Russell puts a lot of time and effort into the museum and we need to be sure to thank him for that effort. Volunteerism is needed everywhere. As a side note, Joe Bell bagged a dear on the way to the party, but decided not to bring it in to the chef for the meal. Its a good thing that Joe knows a good body man. 2006 was a good year for the club, from a financial point of view, with more paid members than ever before. We are picking up members from Toledo to Sidney on the I-75 corridor and Tiffin to the east. We have tried to drive the T's more, with one day trips being the most popular for this group. We had good attendance at the Model T Jamboree and the Hancock Historical Society display. Some of the members are getting the cars out for parades. I'd like to thank all of those that have taken the effort to organize and attend club events. I encourage everyone else to join in on the fun. There isn't a time that I've had the model T out and on the road that I haven't had a fantastic time. Even if things don't go just right, it is still fun. My personal goal is still to get more cars on the road and driving. 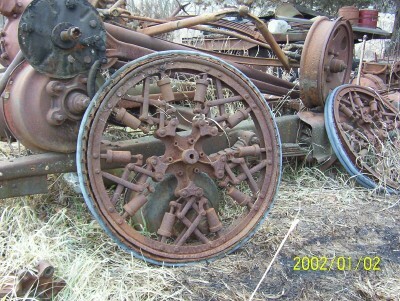 Joe Bell has just returned from a trip to Iowa to pick up a trailer load of Model T parts. I believe that he mentioned 12 motors. 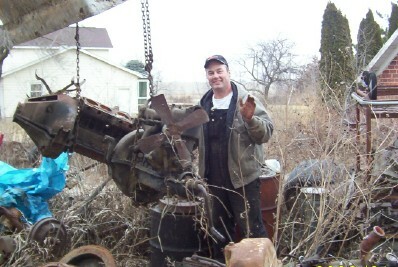 Here we see him standing in a field of dreams, or rust depending on how you look at it. Take a good look at these wheels. I have never seen anything like them. Joe sent me that picture; but, I have not yet asked him if he picked them up. It looks like a bunch of shock mounts.